In the 1970s, when photography was first being seriously accepted into the academic and art historical cannon, over two hundred photographers, editors, critics and curators were anonymously sent plastic Diana cameras from “WE DO THE REST.” Each camera included instructions to make and return sixteen images to the sender, with the promise of an anticipated exhibition. Many responded. The result: an extensive archive of letters, cameras and photographs, which provide an amusing and insightful snapshot of the experimental climate of the photographic community at this time. 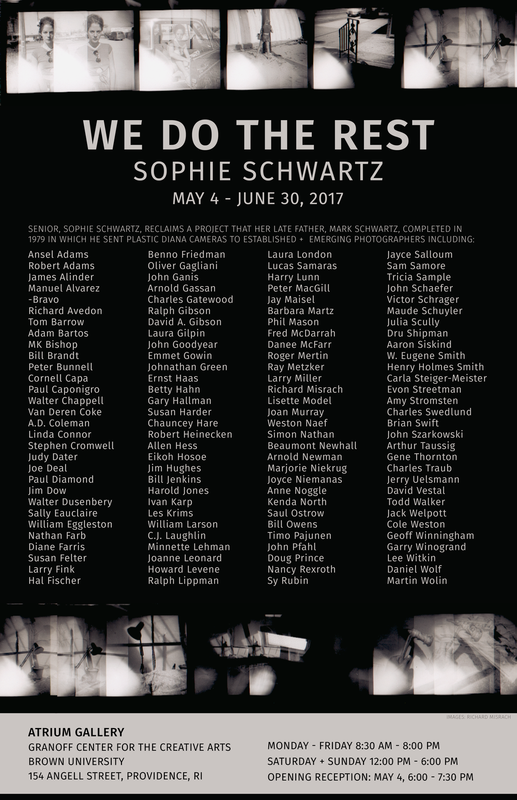 “WE DO THE REST: A Photographic Survey” was first exhibited at Ohio University by its organizer, Mark Schwartz, in 1979, as his MFA thesis. After his passing in 2014, Mark’s daughter Sophie Schwartz, has uncovered and advanced the project, recontextualizing and continuing WE DO THE REST almost 40 years later as her Brown University honors thesis. The exhibition was installed May 4 - June 30, 2017 in the Atrium Gallery of the Granoff Center for the Creative Arts at Brown University.